An Indian couple and a male relative, all in their 20s, got in trouble soon after entering water about 50 metres from shore at Waimarama beach in Hawke’s Bay on Sunday. 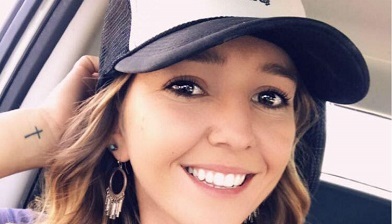 The Indian man was killed by drowning and his wife was taken to Hawke’s Bay Hospital, where her condition was said to have improved from serious to stable. The victim has been identified as 26-year-old Indian National Hemin Vinubhai Limbachiya. He lived in Napier. One person was killed in a crash involving a car and a motorcycle on Purau Port Levy Road, near Christchurch. The crash occurred around 5:30pm. “One person has been confirmed dead following a crash near Sanson at 4.45pm this afternoon. One person is dead following a motorcycle crash on Highway 22 in Pukekawa. 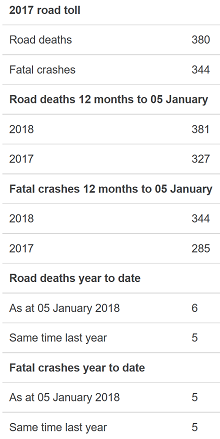 Road Crash Victims nos. 36 – 39 have not been identified by police. Police say they are investigating the unexplained death of a 19-year-old woman in Wairarapa overnight. They have no clue, as usual, as to the cause of death. 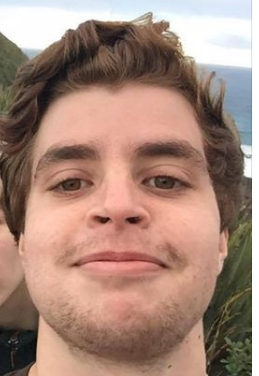 “A 19-year old German tourist has been ordered to pay $5000 in reparations after causing the death of his friend in a road crash near Thames in November.” Felix Eisele pleaded guilty to a charge of careless driving causing death of his friend Melanie Dangel, 19. Stop destroying public property, you bellends! 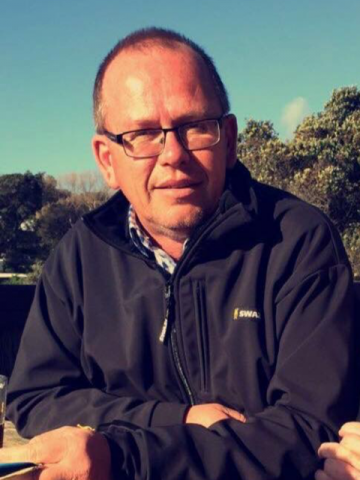 Missing French tourist Pierre Paludet was last seen with his car at a beach car park at Haumoana, Hawke’s Bay, on Friday morning. “There is no physical search taking place today, unless new information comes to light through our inquiries,” police said. The body of a 66-year-old Australian man, who was reportedly hunting near Fox Glacier, Western Ranges, south of Karangarua with his son, has been recovered, police said. The Aussie visitor’s body was found down a ravine by his son during the trip. They were visiting from New South Wales. 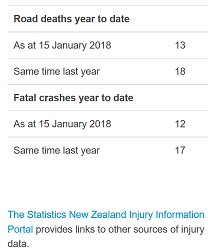 More than 4,000 overseas visitors, international students, foreign workers and recent emigrants have lost their lives and about 24,000 others seriously injured in New Zealand since January 2000. 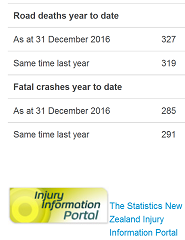 Only one road fatality report allowed by police today, THURSDAY, as of posting, despite several serious crashes being reported locally. UPDATE: Additional fatality reported for Tuesday, May 23. One person was killed after a truck went off a bank in the Malborough district, police said. It happened just before 12:30pm on Kenepuru Road in Portage. “No one’s going to invest without wanting a return, and the key thing for us to ensure is that we are the winners at the end of the day; that the investment stays in the district and that we look after our people and environment and our key values, and any relationship we enter must support that,” said Far North deputy mayor Tania McInnes, who was worried about the council being too quick to embrace the gift-bearing strangers. The Chinese won by just one vote!! 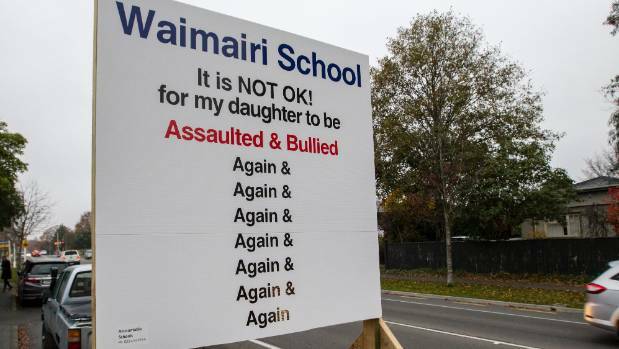 Christchurch’s Waimairi Primary School lawyer is threatening legal action against a father who put up an anti-bullying protest sign near a Christchurch primary school accusing staff of failing to stop his 9-year-old daughter from being assaulted and bullied, repeatedly. Another fatal crash on SH1 between Moore and St Ronan’s Roads, Edendale early this morning has claimed the life of a four-year-old child, police said. “A truck carrying approximately 30 bobby calves left the road and rolled into a paddock at approximately 2:50am. “The driver of the truck sustained moderate injuries and two six-year old siblings of the deceased child also sustained minor (!) injuries. [For the sake of expediency] her death is not being treated as suspicious and has been referred to the Coroner. 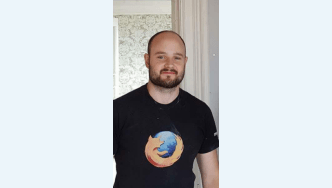 man reported missing from Martinborough last night was found dead this morning, police say. A 54-year-old man has died after he was hit by a car while he was sitting on a park bench in Kaitaia early Wednesday morning. A person is in critical condition after a crash in Northland. An intellectually disabled man who has been detained for more than 10 years for trespassing and smashing windows is fighting for his release. One person was killed in a crash at between Duck Pond and Macartney Roads this afternoon. The victim was Clifford John Irving, who lived in Stokes Valley. The man killed in a fatal crash on Downs Road, Spotswood on December 31st 2016 was 33-year-old Tihi Oterangi Rae Edgecombe of Cheviot. The man killed in a crash on Inlet Road, Kerikeri near Pa Road on January 1st 2016 was 49-year-old Charlie Junior Rihari, who lived in Kerikeri. The woman who was killed when she was struck by a car on Oruru Road, Taipa, on January 1st 2017 was 17-year-old Chloe Hope Hartigan, who lived of Karikari Peninsula. The actual death toll may be as many as 34, with 3 more days to go! Two pedestrian were killed in two separate crashes in the Far North overnight. 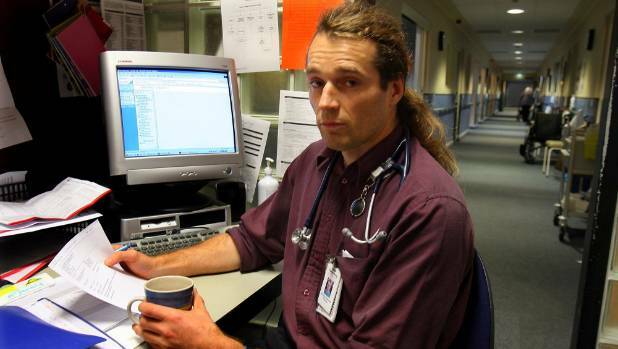 The first occurred at 1:16am on Pa Road, Kerikeri. The male pedestrian was killed. 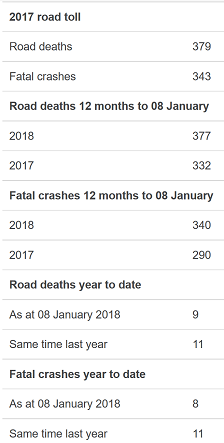 The reported holiday road toll is now six higher than the whole of last year’s holiday period, with three more days to go. 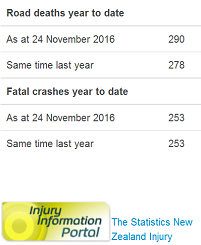 At least 8 people [the reported cases only] have sustained critical injuries in road crashes over the period, so far. 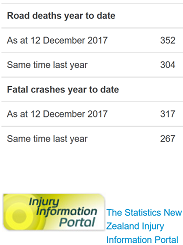 The worst holiday road toll on record, before the official censorship of “sensitive data reporting” began, was 1972/73, when 37 people were killed on our death roads. 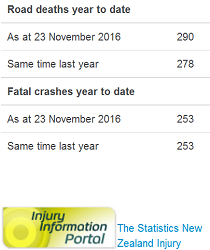 That said, the point here is at least 15 people were killed in 14 crashes, NOT in 15 crashes, as stated by the police (see above image). 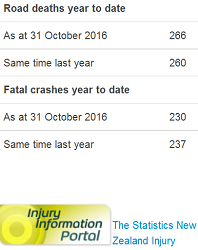 Because, at least two people were killed in the Mangatawhiri crash on Wednesday (November 2). Two people killed and one seriously injured in horror two-car crash on State Highway 2 at Rawiri Rd, near the Waikato settlement of Mangatawhiri just after 6pm, on Wednesday, police said. Five people were killed in crashes within a 15-hour period overnight on Wednesday.